Yesterday’s racing again saw light to medium conditions, warmer than the previous Helly Hansen Warsash Spring Series race but overcast. Black Group start was at East Knoll buoy, with southeasterly winds of 9-13 knots backing almost into the east at times. Courses were mainly windward/leeward with courses set between start and Ryde Middle bank; becoming slightly skewed as the breeze backed further east than forecast. Again this week normal Solent tactics appeared to pay – with foul tide beats sailing to the tides first and wind shifts second was the order of the day. In IRC1 Cornel Riklin's J/111 Jitterbug saved her time on James Bolingbroke's Ker 46 Lady Mariposa R and Frank Roger Bowden's King 40 Nifty to take first place for the second week running, leaving Jitterbug and Nifty leading the class overall. 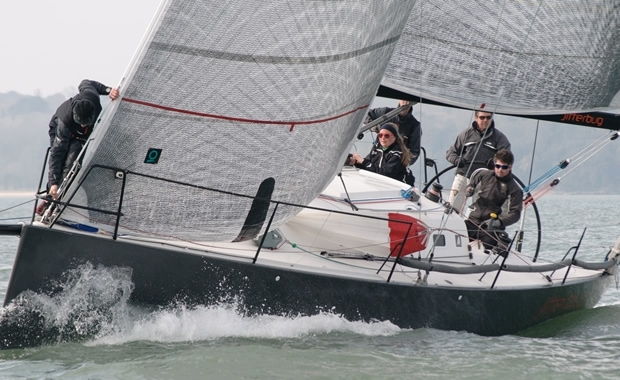 The Reflex 38 Fast-Tack Puma took first place in IRC 2 with Tom Kneen JPK1080 Sunrise second and Beneteau Nick Rawbone's First 40 Playing Around third. These three boats now head the series results so far. According to the Sunrise crew, the only excitement all day was avoiding fishing boats! Mike Moxley’s HOD35 Malice finished first on the water and saved her time to win IRC3 from John Barrett's Beneteau First 35 Stiletto and the J/35 Bengal Magic. Malice built on a good start to lead the fleet around the course, and capitalised on the left wind shift on the last beat. In IRC4 Toby Gorman's Sigma 33 Stan the Boat and Peter Rutter and James Crew's Half Tonner Quokka led the fleet round the course to give Stan her second consecutive win with Alan Fraser's Sigma 33 Prosperro of Hamble second and the evergreen Bernard Fyans' Mustang 30 MkII Erik the Red third – Quokka dropped to fourth on handicap. Those who sailed the leg from Kilchoman to Roger Swinney by going off on port tack to sail up the Ryde Middle bank gained significantly against the foul tide. David McGough's Just So is now leading the J/109 class after posting her second consecutive win, Owain Franks' Jynnan Tonnyx was second with Christopher Burleigh's Jybe Talkin’ third. The White Group start was near William buoy; there was one general recall when the mid line bunching prevented individual boats being identified, but the restart took place cleanly without resorting to the black flag. Jon Powell's J/80 Betty is leading the Combined White Group overall with Patrick Liardet's J/70 Cosmic second and Steve Venables J/70 Injunction third. Betty posted three firsts yesterday to put herself firmly at the top of the J/80 series with Rachel and Robert Hunt's Jumblesail second overall and Terence O’Neill's Aqua-j third. Steve Venables J/70 Injunction posted three first in the J/70 class with Cosmic recording three seconds. Brian Denney's Jalapeno recorded two thirds and David Mcleman's Offbeat gained a third in the third race of the day. This puts Cosmic and Injunction ahead in the J/70 series with Andrew Barraclough's Jenga8 third. There were four SB20s racing this weekend and Aron Wellband's Flutter continued her winning ways with two firsts and a second. She leads overall from James Russel's Blacksone Racing and George Barker's Trouble and Strife. There was a good crowd back in the Warsash Sailing Club clubhouse with champagne courtesy of Rolly Tasker for each class. The free draw for a Crewsaver lifejacket was won by Rachel and Robert Hunt Jumblesail and the draw for a Helly Hensen jacket was won by Andrew Bell's Dark and Stormy. Champagne and prizes were presented by WSC Commodore Nigel Russell.